Life does not come without difficult times, times that often have us wondering what is the purpose of our suffering and exactly where is God in all of it? Often times, the very question of "Where is God in all this?" is a stumbling block for Christians and non-Christians alike. In Where is God? by Dr. John Townsend, best-selling author of Boundaries, the very question of the title is addressed. Townsend explores this topic through personal stories, logical reflection, and scriptures. The 14 chapters cover such things as "Freedom in the Service of Love", "A Hope More Than Wishing", and "The God of Faith When There Are No Answers". Dr. Townsend is a Christian physiologist, which I felt was heavily reflected in his approach on answering this question. In summary, the book seemed to be more of a process for the reader, rather than direct answers that some might be expecting. Townsend does give the reader the insight that it is ok to question and be honest with God, while still having the trust that he has not left you and your situation has a purpose greater than you can perceive. The reader is encouraged to continually seek God in all circumstances and feelings. I personally found the book a very slow read and not very enlightening, though perhaps a thorough discussion for someone that is struggling with this question and needing some direction on being able to approach his or her difficult times. Disclaimer: I received this title at no charge from Thomas Nelson Inc. in exchange for my honest review. Thousands of Free Math and Science Videos! I've just discovered a website that offers thousands of instructional videos for math and science...all for free! Click below to visit the Brightstorm website. They offer math videos covering Algebra through Calculus. Science categories cover Biology, Chemistry, and Physics. They aren't as extensive as Kahn Academy, and do appear to pitch some test prep products for purchase in a separate tab, but one can never have enough free learning videos at your finger tips! 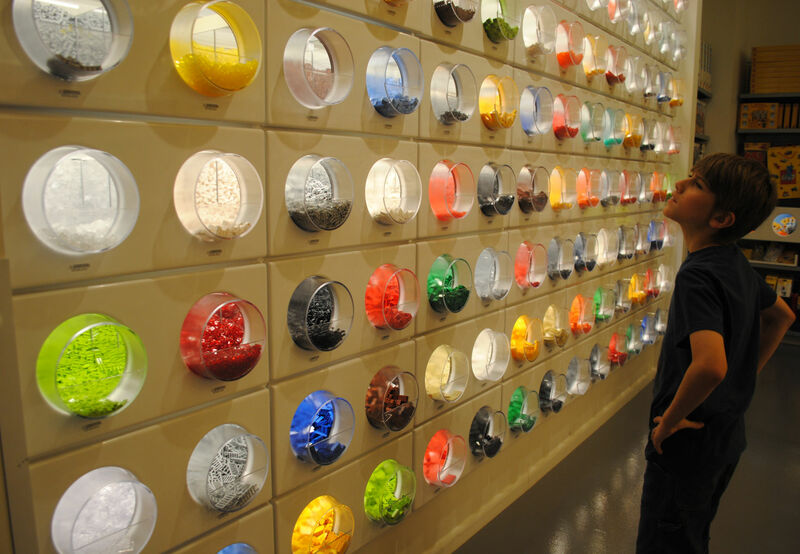 So many Legos, so little cash! Visit Wordless Wednesday to see more of this week's entries. Not that it is a necessary life skill or anything, but WOW...my kids really stink at bowling. Not that I'm great at it either, but it just took me a bit by surprise that they were both so, well...terrible! For his birthday, my son asked if we could go bowling. We haven't been bowling in ages. Years and years, actually. We headed out as a family and my son brought along a friend as part of his birthday celebration. "This isn't anything like Wii bowling!" I think one of my kids now holds the record for gutter balls. No amount of coaching could keep that ball out of the gutter. Strangely enough, my son's friend was equally terrible! You don't even need to knock down any pins (nada!) to have fun! They finally ditched the graceful bowling form and did the 'ole roll-the-ball-down-the-lanes-between-your- legs action. It wasn't exactly graceful, but the scores improved. For the last game, we requested that the bumpers be put up, much to the relief of the kids. They faired better with the bumpers, but none of them reached a score of 100! As bad as they were, no one got upset and we all had a ton of laughs. Even though Wii bowling is a bit more encouraging (I suppose no one would buy it if users constantly got gutter balls), I think the real deal is a lot more fun. I have no more babies, no more preschoolers, and no more grade school students. In another year, my mothering of tweens is over. My youngest turns 12 today. This is my fun-loving guy. He's a Lego-maniac, always quick to give hugs, loves to play family games, and is just an easy- going, happy kid. Most days at least. I do get glimmers of surly teenagedom lurking around the corner sometimes. I suspect today won't be one of those days, though. Happy birthday, Bud! Next year on this day, I'll be mom to teenS. Yes, plural. Am I ready for it? That is still yet to be decided. At least I have a year to figure it out. 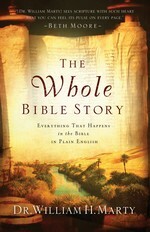 The Whole Bible Story, by Dr. William H. Marty, is described on the cover as "Everything That Happens in the Bible in Plain English". As someone who gets bogged down with some of the books describing laws and genealogies every time I attempt to read the Bible Genesis to Revelation, I thought The Whole Bible Story, with a focus on the beautiful story of the Bible, would be something I would both enjoy and appreciate. While I did appreciate this title on some level, it was not what I expected. It didn't quite have the story-telling narrative that I had envisioned. Instead, it was more like an extended Cliff-Note version of the Bible, with straight-forward rewording and retelling of the original text. I did, however, find some value in it despite not being what I anticipated. The text is broken down into chapters of topic, rather than book and verse, and presented chronologically. Some might find reading this "plain English" version before reading the actual Bible may help give them the broader picture they need to understand the original better. On its own, though, The Whole Bible Story just didn't pull me in as I had hoped. This isn't a title you'd want to curl up with and read aloud to your kids. However, if you are a "just the facts" type of person, or are looking for an overview of the events of the Bible, this title may be worth a read through once. Disclaimer: This product was given to me by Bethany House in exchange for my honest review. I haven't had a chance to peruse this site too much yet, but it looked like one worthy to share with my fellow homeschoolers and educators. You are able to search for items by grade, subject, type of resource and type of usage. I did a search for American history resources in the 9th-10th grade range and it came up with a list of over 1200 items, including full online (free) courses. This might be one to bookmark for future lesson planning. When my kids were younger, we used to take field trips to local establishments and businesses that would show us a behind-the-scenes look at their operation. My kids loved these trips, but we pretty much exhausted all that was available in our local area. Or so I thought. When an opportunity recently came up for a tour at Al Dente Pasta, I thought it would be a fun outing and a break from the kids’ studies. Al Dente Pasta, located in Whitmore Lake, MI, is a family-owned business that has been in operation since 1981. Our tour started with owner Monique Deschaine explaining to the kids how the business got started and what they would see on the tour. Then, we all donned our hats and hair nets and proceeded to the factory area. The first piece of equipment we saw is used to mix the ingredients, then roll and cut the pasta dough. if you look closely in the pic above, you can see the woman at the top constantly monitoring the ingredients for the best pasta dough. Then the workers at the end of the machine place the cut pasta on racks to dry. Notice how the noodles are green? They were running spinach fettuccine the day we toured. Once the pasta is dry, it is bagged and boxed, ready to be shipping to various locations across the U.S.
Monique brought out a tray of freshly made pasta so the kids could see what the pasta felt like before it dried. Afterwards, Monique spent a lot of time with the kids talking business. The kids asked various questions about Al Dente, as well as shared their visions for their own businesses. They were all encouraged to go after their dreams. Thanks, Monique, for a great peek into Al Dente Pasta. And if the tour weren’t great by itself, I was lucky enough to get the opportunity to take home some pasta to review! It is a good thing, too, because my kids were already drooling and pawing the pasta on the shelves. I was sent home with five different kinds of pasta and Monique’s Marvelous Marinara Sauce. Al Dente Pasta is very careful that only quality ingredients are used for the best taste and texture. Bet yet, for all you busy moms out there, it cooks in only 3 minutes! The first night we tried the Garlic Parsley Fettuccini with the marinara sauce. And yes, that pasta truly cooked up in only 3 minutes! Gotta love that. Dinner was gobbled up in no time and received thumbs up all around. Next, I tried the new Golden Egg Pappardelle. These are very broad noodles, definitely some substance here. I just used them as a side dish, but later thought how great they’d be in some chicken noodle soup. I love making homemade chicken soup and the wider noodles will make it more filling. I’ll be looking for this variety next time I go to the store. Now, if you are one to think pasta is a boring dish, you’ve never heard of Al Dente’s Squid Ink Fettuccine. Interesting, eh? I wasn’t sure about consuming squid ink, but I was willing to try. Luckily, my family was adventurous enough to try black pasta. It didn’t have a strong taste like I thought it might, but did have a distinct flavor. I served it with some salmon (for a little seafood theme), but wouldn’t this be fun to serve around Halloween or at an Over the Hill birthday party? Apparently, there are some health benefits to consuming squid ink, but I thought it was just something unusual and fun to try. So far everything we’ve tried from Al Dente has been tasty. They have a variety of pastas to try and I love that I’m supporting a local, family-owned business. I’ll be keeping an eye out for the Spicy Sesame Linguine at my local stores, as that sounds too tasty to pass up. I bet it is fabulous in a summer pasta salad. If you follow Al Dente on Facebook, recipes are often shared there (as well as on the back of the packaging). Al Dente is available nationwide in grocery stores, or you can order from the Al Dente website (check out the gift baskets!) or from online retailers, e.g. Amazon. Give Al Dente a try next time you want a healthy and quick (remember - only 3 minutes!) dinner. Disclaimer: I was provided the product free of charge in exchange for my honest review. I have received no other compensation.